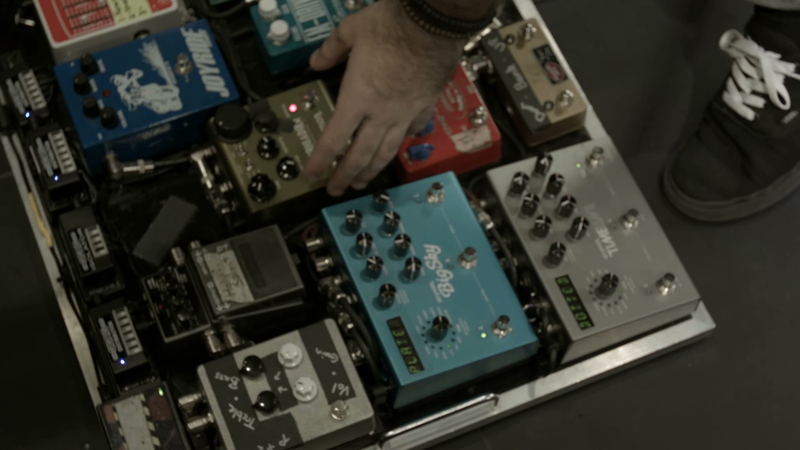 Mike Pope walks you through the delay and reverb pedals he uses and how he uses them. He also covers auxiliary pedals that bring sparkle to his sound. - It sounds kinda like a memory man, but it doesn’t break and it’s smaller. - It is first in line but is a secondary delay because it is filling space or creating ambience in the swell. - Turn repeats up pretty high, most of the time he has it off and turns it on for chords or picking line. - He uses it for swells. - How to use: Controller lets you go easily through the delay settings. You don’t have to worry about tapping it. - Very easy to use. He starts running in stereo. Is stereo better than mono? Mono is a direct sound. Stereo is direct too, but you get the option of making it sound big and wide. - Inears can sound stereo, adding reverb gives you back room fill. - You can control and low end seperately. - It adds a little bit of room to the tone.